Christian Educators often struggle with identity issues — what is my role and function within a local church? Am I a supervisor of programs or a spiritual guide? 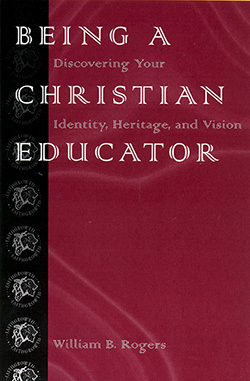 Rogers offers clear guidance to Christian Educators, helping them discover an identity grounded in the needs of the modern church, and informed by Christian history. Being a Christian Educator guides readers in developing a strong philosophy of educational ministry, including a core vision. Curricular tasks such as Bible study, discipleship, community and worship are explored, helping educators to provide real leadership across these varied areas. Rogers concludes the book by drawing a distinction between "knowledge" and "news", pointing to real differences in the nature of content, and how it is approached. His insights bring fresh energy to educational ministries, and wise counsel for busy Christian educators. William B. Rogers has been involved in theological education as a Christian educator for the past 23 years. He has served as professor of Christian education at the Baptist Theological Seminary at Richmond and for nearly a decade was the dean of the School of Christian Education at Southern Baptist Theological Seminary in Louisville, Kentucky.